Happy Tuesday loves! Summer is officially here and man have we been feeling the effects already! It was already over 100 this weekend (before the heat index) so I'm pretty sure it's only going to get hotter! With temperatures that high I'm living in maxi dress and bikinis so when I saw this adorable maxi from Sophie & Trey I absolutely had to get it. Even though, like all maxi dresses, it's way too long on me I knew it'd be cute with wedges and I could always get it hemmed even though I'd lose the pretty detail on the bottom. I love the pretty crochet detail at the neckline and the crisscross back which makes it perfect for those hot summer days. The material is also very lightweight and flowy so you don't have to worry about a lining weighing the dress down or making it ridiculously hot. Because it's already so hot out I kept my accessories at a minimum. The less I have on me to get all hot and sweaty (is that TMI?) the better! What are your summer go-to looks to beat the heat? Tell me I'm not the only one who tries to wear clothing that makes you feel like you're wearing as little as possible (without actually wearing as little as possible) to beat the heat? Sorry for the short post today ladies! I'm exhausted after getting up super early and going to the gym so I'm heading to bed early tonight! Hope everyone has a fabulous day! This dress is such a gorgeous print, you look amazing in it! Maxis are perfect for summer! And I love the back of this dress- gorgeous! This dress is gorgeous on you girl, especially loving the open back detail. So pretty! So pretty!!! You know how I feel about Maxis and the print on this one is so pretty! I haven't been over to Sophie and trey in forever! I love dresses with different backs and this one is so pretty! Perfect for the summer heat! That dress is the living end....it is perfection and looks amazing on you!! LOVE! So pretty! This dress is gorgeous on you, girlfriend! Gorgeous! I love the print and the back! And that hat is sooo chic! This dress looks so beautiful on you, I just love the open back details! You are not alone girl, the less the better. Not the way it sounds, but you know what I mean :) I want to stay cool! Love the dress, the back is so pretty. Gorgeous! And I'm right there with you on having to get everything hemmed - I just made an alterations appointment this morning, ha! That dress is gorgeous, lady! I love the print and the details along the neckline, so fun! What a gorgeous dress! The print is so pretty and I just can't say no to an interesting back! Oh and I totally feel you on the wear as little as possible front. It gets so humid in the midwest that I legit plan my outfits based on what will touch my body the least hahaa! Gorgeous dress, you look stunning!!! And yes, it's been way too hot!! Cute dress! Love the back and details at the bottom. What an adorable dress! The print is just beautiful, love the pink flowers :) Summer is taking its reigns here too! Love that last shot with the back detail. Maxi dresses for the Summer heat are just the best down here. Looking gorgeous girl! The maxi dress is adorable! Love the print and fun colors. 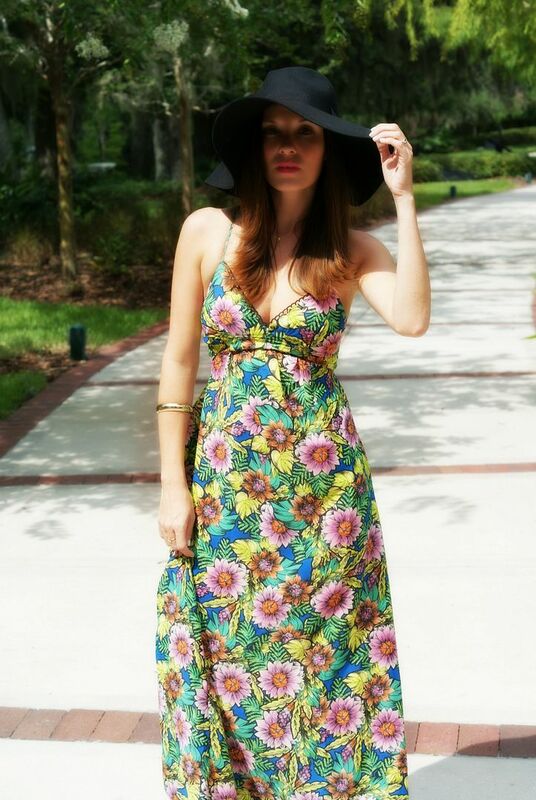 Pamela, this gorgeous floral maxi dress is meant for you. Period. This is such a gorgeous dress! I love the pattern and detail on the bottom. this maxi dress is just gorgeous!!! I love that dress, so pretty!! Such a fun back. And that black hat looks fabulous on you too! I cant even handle long dresses or skirts when it is THIS hot outside. I try to stick to above the knee....and because maxi dresses look ridiculous on me anyways...but that dress makes me want to try them again. This dress is amazing. It looks so pretty on you and I love the tie up detail at the back! Love the back of that maxi! And I'm with you, I try to dress super lightweight in the summer! 10000% in love with this dress!! Lightweight dresses are the only way to go in these crazy temps! This is the most fabulous look! I love light weight dresses right now and those colors in the dress are fantastic! The floppy hat looks amazing too. Once again you picked a great dress with a killer back. Love the hat, per usual, my friend! What a beautiful pattern on this dress! I have the same problem with maxis, they are always too long. Definitely one of the most comfortable hot weather options though, that's for sure! What a beautiful maxi dress on you! I love the detailing of the back and that print is stunning! Love the dress!! Can't believe how hot it's been there! We have had massive amounts of rain here in IL for about the last 3 weeks, I could really go for a hot sunny day! Oh my! I can't stress how much I love this dress - beyond gorgeous! !